Halloween in Ireland has been celebrated for centuries and first originated from the festival of Samhain which dates back over 2,000 years. Samhain in Ireland was an important festival, it marked the end of the bright half of the year and the start of the dark half. It was also a time to honour the dead and gods using pagan rituals. As Christianity spread across Europe, including Ireland, pagan rituals of Samhain died over time. In its place, Halloween became the main festivity although some of the traditions of Samhain remained. Where did ‘Trick or Treat’ come from? 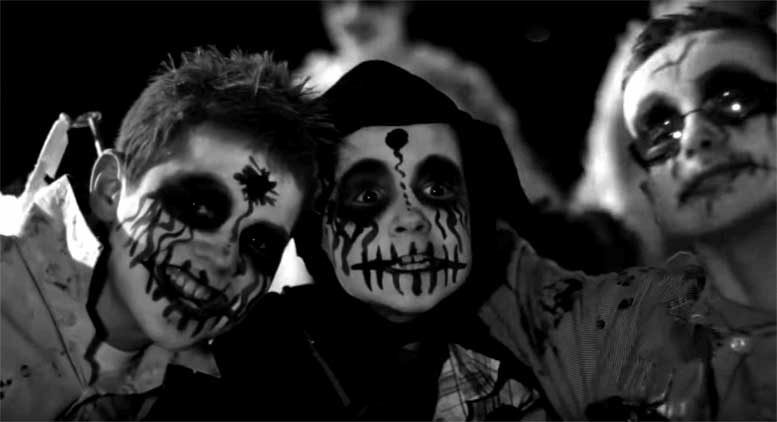 The custom of ‘trick or treat’ was founded in Ireland when children and the poor went from door to door at Halloween. They sang songs or offered prayers for the soul of the dead in return for food, usually a soul cake which was a flattened bread that contained fruit. This tradition was known as ‘Souling’. Why do people wear fancy dress on Halloween? The custom of dressing up in costume comes from an old Celtic tradition when people used to dress in costumes that resembled evil spirits in order to placate them. At Halloween when the veil between the living and the dead is at it thinnest men would have dressed in white and blackened their faces to resemble the dead to acknowledge them and so appease them that they might not visit the homes of the living or if you were to meet a spirit on your travels they would accept you as one of their own and not be tempted to carry you away in the morning. Where did Jack-O-Lantern come from? 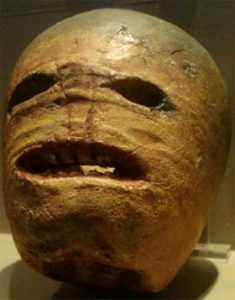 The Jack-O-Lantern today is usually carved out of a Pumpkin; this has been passed over from America but in days long ago the Irish would have used a vegetable typically a turnip or swede as these would have been widely available and this tradition was taken to America along with the Irish immigrants. The origin of carving Jack-O-Lanterns is unclear but an old Irish folk tale tells of Stingy Jack a lazy Irish Blacksmith who tricks the Devil and traps him using a cross and refuses to free him until the Devil agrees not to take his soul when he dies. Many years later Jack dies and because he was lazy and no good during his life he is refused entry to Heaven so he turns to the Devil who will not back down on his promise and refuses to take his soul distraught Jack cries out that he has no light to see his way through the darkness of eternity and laughing the Devil throws him a flame that has come directly from Hell and will never extinguish so Jack is forced to carve a lantern out of a turnip that he may find his way as he wanders the Earth for all Eternity, he became known as Jack of the Lantern or Jack-O-Lantern. How is Halloween Celebrated in Ireland Today? Today Halloween is a holiday devoted to fun and pranks, feasting and dressing up and of course trick or treating. It is not unusual to see houses in Ireland decked out in all manner of decorations from ghosts and witches to Vampires and Banshees. A growing trend here in Ireland is to have a Halloween tree, not unlike a Christmas tree but it is black and has all types of Halloween creepy crawlies attached to it. Children will run from door to door, dressed in wonderful colourful costumes from evil witches to nasty little hobgoblins all shouting, “trick or treat” and they will receive sweets, fruit or nuts so ensuring that the house will be safe from any tricks the children wish to play. The city of Derry has become the best place to visit for Halloween according to a USA Today poll in 2015 for the top 10 destination to visit for Halloween. Its a long tradition of Derry to celebrate Halloween with thousands taking to the streets to celebrate one night of being in fancy dress. The city boosts a major festival every year including parades, fireworks, and other Halloween festivities. Other cities around Ireland are also following with celebrating Halloween holding large parades and events for families. What Do The Irish Eat At Halloween? Traditionally Halloween was a day that feasts were held and this tradition has not died out. Although in Ireland, Halloween used to be a time of abstinence when no meat was eaten so foods that were typically eaten would have been home made Apple Pies and of course Toffee Apples but first you would have Colcannon, Potato Farls and not forgetting Barmbrack which is a bread that contains fruit, a slice of which has to be left outside before you go to bed so that any passing Faeries or Spirits may feast as well and bestow good luck upon your household. Many of these dishes would contain a coin as a ‘lucks penny’ which the finder kept safe and fortune would follow them in the coming year. These customs carry on to-day and these foods are still typically eaten although the not eating of meat is no longer observed and Irish Stew is a common dish to feast on before heading out into the cold to watch the fireworks and go trick or treating. All this food would need washed down and an old drink that was drunk is called Lambswool. The name Lambswool is believed to be a corruption of the Irish Gaelic, “La Mas Nbhal” meaning ‘Feast of the Apples’, it was pronounced “Lammas-ool” and this eventually evolved into Lambswool. Various recipes exist for this drink but the bases of it are: Roasted crushed apples, which are added to milk, hot spiced ale, cider and or wine. Sugar is then added according to taste. Bits of toast can be added if desired. After all this feasting the adults usually party on into the ‘wee small hours’ while the children go upstairs to terrify each other with tales of wailing Banshees and ghosts that walk the corridors of their schools and all things creepy and scary that go bump in the night. Serena is a cat lover and writer, in that order.